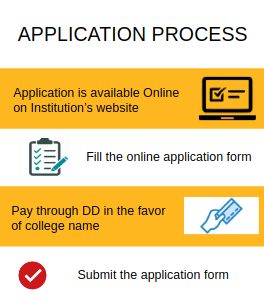 For Application process candidates should visit the official website of the affiliated college. Visit the official website of the Maulana Abdul Kalam Azad University of Technology, Kolkata. Pay the requisite amount of application fee through Credit/ Debit Card/ Net Banking. Students should write the WBJEE 2019 exam. 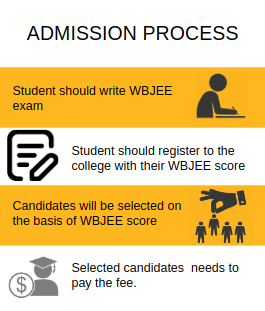 Students should register them with their WBJEE score on the college website. Candidates will be selected on the basis of WBJEE score. 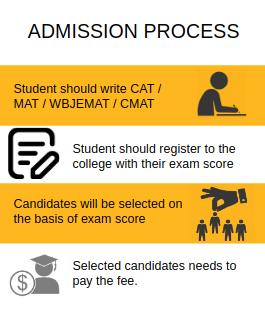 Students should write the CAT / MAT / WBJEMAT / CMAT 2019 exam. Students should register them with their exam score on the college website. Candidates will be selected on the basis of the exam score. Admission is given to the candidates on the basis of their merit. The candidate who wants admission in Calcutta Institute of Engineering and Management 2019 must be a 10 + 2 pass out with 45% in PCM combination. Selection is based on candidates’ performance in the Joint Entrance Examination and as per the norms stipulated by the AICTE and the Govt. of West Bengal. Candidates seeking admission to MBA program must hold a Bachelor’s degree in relevant discipline from a recognized university. Candidates seeking admission to MBA program must hold a Bachelor’s degree. Candidate should have passed 10 + 2 with Mathematics / Computer Science / Computer Application / Statistics as one of the subjects from any recognized board. Candidate should have passed 10 + 2 qualified with English as one of the subjects from any recognized board. The eligibility criteria for BCA in this college is 12th pass with a Computer Science-related subject such as Mathematics, Computer Science or Computer Applications. Even if you are an Arts background student, you can join BCA if you studied Computer Applications. No entrance exam is required to join BCA. Typical cutoffs for this course is 55% in the computer related subject and 50% overall in your higher secondary exam. The name of my college is Calcutta institute of engineering and management(C.I.E.M).it is located in Kolkata. CIEM provides engineering courses for bachelor and master degree.To get admitted you need to give entrance exam called West Bengal joint entrance examination and all India entrance examination.you can apply only after completing the 12th standard from any respected boards.you should have an average of a minimum of 60%in math, physics and chemistry in each. Ciem has good campus facilities.the faculty members are truly very supportive. Campus facilities should be improved in future.my experience with this college is quite good. I took the WB JEE in 2012, and after consequent rounds of online counselling, the results were announced. The counselling process primarily scans your rank and suggests the best college based on your rank. In 2012, there were three rounds of counselling. Generally, if you have patience and wait till the last round, there is a chance to get into better colleges. Calcutta Institute of Engineering and Management takes students with ranks ranging from 20000 to 50000(based on information gathered in 2012). Eligibility criteria: JEE main score, WBJEE score for admission, your score in WBJEE should be matched with the college cutoff, college cutoff changes per year. The eligibility criteria for admission was that the student must have passed 12th and must achieve a good rank in WBJEE entrance exam. To get selected for admission process candidates must score well in their 12th boards.